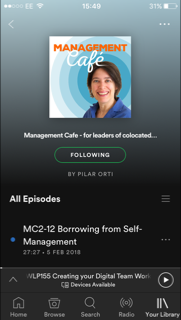 In this episode, Pilar talks to Julian Wilson, CEO of Matt Black Systems, about how the company made the transition to self-management. The journey was worth it, but also a bit painful... 1hr 07 mins - long, but worth the listen. 08:10mins As "Management" has been given a bad name by the terrible (but very visible) bad managers out there, companies and people are turning to self-management as a way to improve companies and worklife. But should we be pursuing self-management as an end in itself? "We measured the machines and the processes but we didn't measure the people." Lean manufacturing didn't quite work. The problem didn't lie with the tool, but with the culture. How do you change the culture? Micromanaging didn't work, standardising operation procedures didn't work. Julian gives us a specific example of how they made savings in Purchasing. How the company cut down on administrative staff. Should you give admin tasks to people who don't like doing them, so that they get done faster?! "I wouldn't do it like this again." Changing culture is difficult; you're changing habits. Why are we not trusted at work to do things and make decisions like those we take in our personal lives? When you trust people and de-centralise, you will come up across some problems. Recruitment - who stays, who goes and who is recruited? Do businesses need to grow? Julian is setting up a new organisation, based on the Buurtzorg model.